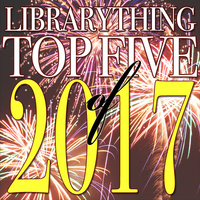 We also like seeing members’ favorite reads, so we compiled a list that all of LibraryThing can add to. We’re interested in not just the most read books of 2015, but the best of the best. What were your top five for 2015? Note: books on this list weren’t necessarily published in 2015—these are the best we’ve read this year, regardless of publication date. »List: Top Five Books of 2015—Add your own! This is one of the most unusal and unexpectedly lovely WWII stories I’ve read. Only Sarah Vowell can write a history of Lafayette (Everyone give it up for America’s favorite fighting Frenchman!) that mentions the recasting of Darrin on Bewitched. My only regret is that I didn’t discover this one sooner. An amazingly well-written book about loss and how the narrator deals when her identity is ripped away from her at a young age. That somehow manages to not be too depressing. It also helps that the narrator is an avid reader, and the book is full of references to (real) books she’s read. Short (for me), simple (in terms of plot), and moving. Plus, Jen Wang’s illustrations are lovely. I read all of The Expanse series (so far) in about two months. Each book was better than the last, and this one was no exception. The Song of Achilles by Madeline Miller: So well-written. I laughed; I cried; I mostly cried. Because we all know how this one’s going to end. The Hundred Thousand Kingdoms by N.K. Jemisin: This was a SantaThing gift I received last year, and it was such an amazing pick that I probably would have missed on my own. I have a sneaking suspicion that Jemisin’s latest, The Fifth Season, will make my 2016 list. Robin Wright, Wallace Shawn, Billy Crystal, Christopher Guest, Mandy Patinkin, Bill Goldman, and Rob Reiner all read from their interviews from the book. Combining archaic, steampunk, and modern technologies, while deftly bringing the main characters’ stories together through dedicated chapters, this truly is the best new fantasy I’ve read in some time. I enjoyed this one more the further I got into it. By the last page, I was ready for the next book in the series. While I was wary of another retelling of Oz, it was well done and didn’t feel tired. A bad year for fiction, except for all the books I read or reread with my son (e.g., Holes, Hobit, Heinlein). This and Freely’s others got my family though Isanbul. Great book, but especially so since it formed the structure of an hour-long retelling of the Fall that I did with my son, over dinner in the Galata tower, overlooking the action. Should be required reading for everyone who argues onlne. I cast around for good science fiction, and rarely find it. So I was expecting to drop this after a few chapters. It’s a much better book than that. A huge, new encyclopedia of the reception of Antiquity—hugely enjoyable, but perhaps not for all. Delightfully strange story I picked up as an ARC at ALAMW14. It stayed with me long after I finished it. TBC is the last book I read before giving birth to my son and I’m SO GLAD it was good enough to hold me over until I had the brain capactiy to once again read. Kaling’s second effort outshines her first. While her first book focused on what guys should wear to look hot, her second is a collection of opinions on being a successful woman and not apologizing for it. And also gossip. It was delightful. I live on random knowledge and this book was chock full of the stuff. Loved it. One of the more beautifully written books that I’ve read in a while. The author puts my heart into words, when it comes to planes and the heart-longing-lonliness of why we travel. Reminded me how much I once wanted to be a pilot. Much like a perennial favorite of mine, The Manticore by Roberston Davies, his person’s trip through therapy was therapeutic in itself to read. I also highly recommend the related (Tony winning) book/musical Fun Home, if you like using theater to feel big feelings. I’m always a sucker for dysfunctional Irish families and also “enduring holidays with people you don’t like” narratives, so this was perfect. Everything in the Dublin Murder Mysteries series is good, and this is no exception. Great read, great character development. I read all 3 of the Cormoran Strike novels this year. All of them were great detective stories, but the first was my favorite. The third book in Brent Week’s Lightbringer saga. Not as great as the other two, but keeps the story going with enough cliffhangers to want to read the next installment. A classic anyone who develops software in an organization should read. Interesting read especially about the mindset of people working in this field. How could I get any better? Seriously though, a helpful collection of essays or lessons focusing on various aspects of the software development process. This was a fun YA read, and I probably liked it so much because it was the first fiction book I’ve read in a *long* time. It was also reminiscent of a lot of the fantasy novels I read as a kid. I had a pretty long stint of reading non-fiction, DIY, and self-help books. Happy that my Secret Santa from last year’s SantaThing awarded me this book! Will definitely be reading more from this series. This was my first novel by Waters, and it won’t be my last. Waters’ writing immerses you into the time where the novel is set, her attention to detail draws you into the story in a way that only a skillful writer can. Excellent character development. What an interesting aspect of WWII research. This historical novel looked at the war through the lens of music and its influence on entire cultures and nations. Not just any music, but that of the famous Soviet composer Dmitri Shostakovich, peering into his entire tumultuous, revolutionary life in Leningrad and seeing the common “chord” through it all that never lost Shostakovich’s focus. A passionate story that bolsters music as one of the all-time unifiers in life. 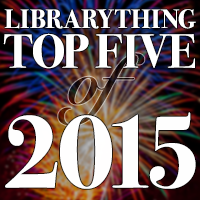 Tell us about your favorites for 2015 on Talk, or add your own Top Five to our list! 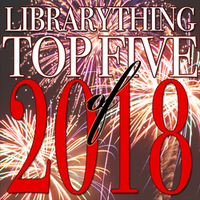 For the last two years running (2012 and 2011), LT staff members have each compiled a list of their top five reads for the year. 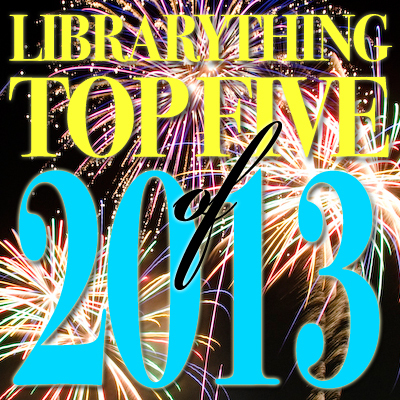 For 2013, we wanted everyone to get in on the fun, so we compiled a list that all of LibraryThing can add to. We’d like to see not just the most read books of 2013, but the best of the best. 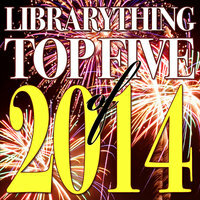 What were your five favorite reads of 2013? » List: Top Five Books of 2013 — Add your own. Parable of the Sower by Octavia E. Butler Mike’s suggestion. Wonderful atmosphere. Eifelheim by Michael Flynn Unexpected story of aliens landing in 14c. Germany, and of misunderstanding and understanding. Benjamin Bear in Fuzzy Thinking by Philippe Coudray First book my son read cover-to-cover. The Horse and His Boy by C.S. Lewis I don’t believe I had read it before. Told it was a dud, but I loved it. The Circle by Dave Eggers Not the greatest novel qua novel, but it’ll stick with me. And it was enormously validating to have some of my fears put out there. The Black Cloud by Fred Hoyle: Bad “classic” science fiction. Didn’t finish. Children of God by Mary Doria Russell: I adored The Sparrow. The sequel is a big disappointment. It’s a “negative sequel.” Like the Matrix sequels, it makes the original worse. The Midwich Cuckoos by John Wyndham: Bad “classic” science fiction. *Abby would like it noted that she blames The Circle by Dave Eggers for making her put other books on hold, which might have actually been the best this year. You Are One of Them by Elliott Holt: A 1980s Cold War bildungsroman, complete with spies and mistaken identities?! I was supposed to love this book. I did not love this book. This one’s a re-read for me (for sci-fi book club), but it’s also one of my all-time favorites, so it’s going on the list. Definitely my most anticipated book of the year, and it did not disappoint. Allie Brosh is a hilarious, insightful genius. This one didn’t change my reading life the way his first novel, The Gone-Away World did, but it’s also excellent. I binged on the whole trilogy in about a month, but this was my favorite by far. I absolutely loved The Shadow of the Wind and The Angel’s Game, but didn’t think this one quite measured up. Still very good, though. The Circle by Dave Eggers: I really enjoyed doing One LibraryThing, One Book, but when I finally finished this one, I wanted to throw it against a wall. I just did not like it. At all. Dhalgren by Samuel R. Delany: Another selection for sci-fi book club. I just couldn’t get into this one. I didn’t even make it to the halfway point. Kept waiting for things to get interesting/start making sense, and they never did. Tell us about your favorites for 2013 on Talk, or add your own Top Five to our list! Why Big Fierce Animals are Rare: An Ecologist’s Perspective by Paul A. Colinvaux. Danny the Champion of the World by Roald Dahl (with my son). The Art Forger by B. A. Shapiro. Why Be Happy When You Could Be Normal? by Jeannette Winterson. Thomas Jefferson: The Art of Power by Jon Meacham. The Fourth Part of the World by Toby Lester. The Icon Handbook by Jon Hicks. The Art of Urban Sketching by Gabriel Campanario. The Road to Ubar by Nicholas Clapp. Charles Jessold, Considered as a Murderer by Wesley Stace. The Passage of Power by Robert Caro. The Rector and the Rogue by W.A. Swanberg (the new edition edited by Paul Collins). The Social Conquest of Earth by E.O. Wilson. The Stockholm Octavo by Karen Engelmann. Honorable mentions here for The Beekeeper’s Apprentice by Laurie R. King and PYG: The Memoirs of a Learned Pig by Russell A. Potter. NB: I always post a top ten fiction and a top ten non-fiction list on my blog on December 31, so check in there at the end of the year for the complete list. Kate gives an honorable mention to Pulphead: Essays by John Jeremiah Sullivan. The Riyria Revelations (series) by Michael J. Sullivan. Chronicles of the Black Company by Glen Cook. Hide and Seek by Ian Rankin. Mistborn: The Final Empire by Brandon Sanderson. The Hitchhiker’s Guide to the Galaxy by Douglas Hunter. PHP Master: Write Cutting-Edge Code by Davey Shafik. What were your favorite 2012 reads? Come tell us here.